Illuminated manuscript on parchment, 152 fols. 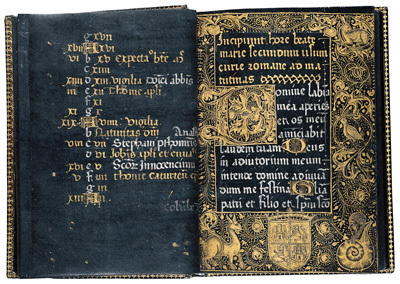 Given the extreme rarity of books of hours on vellum stained with black ink or painted with black pigment, this is one of the most singular items in the Hispanic Society's manuscript collection. The manuscript is unfinished in that the artist left space on the pages facing the beginning of each office for a miniature. The calendar is appropriate for the Crown of Aragon, with the canonization of St. Vincent Ferrer in 1455 as the earliest possible date of composition of the manuscript. One of the folios pictured, folio 13r, bears a coat of arms which is that of Castile and probably refers to Maria, queen of Alfonso V of Aragon, who died in Valencia in 1458. It has been suggested that this book of hours was conceived as an offering of bereavement to Maria of Castile, with the fact of its being executed on black parchment and her coat of arms, no longer blazoned with Aragon, being cited as evidence. The artist is most certainly Flemish, probably working for the Aragonese court. Text and images © Hispanic Society of America.